April 10, 2017, Coast Salish Territory/Vancouver, B.C. – More than half (59%) of British Columbians say they are interested in socially responsible investing (SRI) but have yet to participate in the growing market, according to a new report from Vancity credit union. The number is even higher among younger B.C. residents, with 75 per cent of millennials saying they are interested in SRI, but have yet to invest. The report, Untapped Values: socially responsible investing in British Columbia found that almost half (45%) of B.C. residents report “not having enough money” as the single biggest barrier to investment in SRI, while the next largest barriers are a lack of knowledge about socially responsible investments (37%) and not knowing enough about how holdings in an SRI fund are chosen (37%). If barriers to SRI participation can be addressed by investors, financial advisors and financial institutions, the report estimates that British Columbians could contribute as much as an additional $15 billion in socially responsible investments in the next three to five years. Recommendations in this report are directed not only to investors to gain more understanding about their portfolios and SRI funds in general, but also to financial advisors and financial institutions to educate clients regarding SRI as an investment option. SRI is defined as choosing and managing investments based in part on how companies impact people and the planet, and how ethically they manage their businesses and operations. SRI products now make up over one-fifth of assets under management in the United States, and over one-third of all Canadian assets under management. 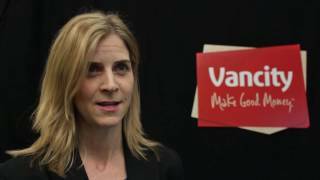 The survey of 827 British Columbians was commissioned by Vancity and conducted by Insights West from January 20 to 25, 2017. All data is weighted to be representative of B.C. residents on gender and age, and a margin of error for a probability sample of this size of +/-3.4, 19 times out of 20.